How are providers designing communities to promote health? Healthy food and exercise classes might have satisfied the health and wellness needs of senior living residents in 2009, but in 2019 health-conscious older adults are demanding a living environment that integrates all aspects of well-being—social, emotional, spiritual, environmental, intellectual and physical. One way to respond to this demand is to increase health programming; another is to integrate health and wellness into the very design of physical buildings and landscapes. Air is among the 7 categories of health that WELL focuses on (the other 6: water, nutrition, light, fitness, comfort, and mind). According to Wilson, the air quality in WELL buildings is much better than in traditional structures, as WELL builders increase air changes by 20% over code and specify HEPA filters, which are 50% cleaner than average filters. “At-risk populations, those with asthma or COPD or breathing issues, are doing much better because of the improvement of air quality and a reduction in irritants,” says Brandon Nicholson, founding principal of NK Architects, which has overseen the design of two passive house senior residences. As with air quality, light can also have a huge impact on health, including circadian rhythms. Wilson says his firm is exploring using tunable LED lighting for a memory care project, as it may help to correct disruption of the circadian rhythms, which is associated with Alzheimer’s disease. Wilson believes that tunable lighting may help prevent sundowning in people with dementia, and improve their sleep. open up access to a patio. Simpler lighting changes can also impact health. For instance, the effect of swapping out incandescent lights in favor of brighter LED lights at Dock Woods, Lansdale, PA, part of Living Branches, was “phenomenal,” according to chief marketing and public relations officer Alex Metricarti. There are other ways to add natural light. 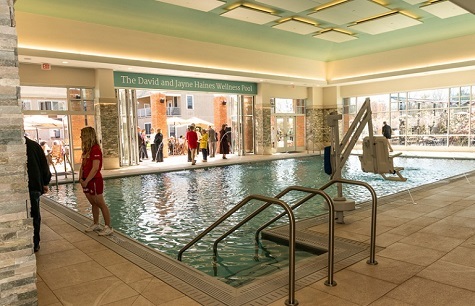 For instance, Meadowood Senior Living, another life plan community in Pennsylvania, built an indoor pool, which is glassed in with a 30-foot Nanowall that can fold back like an accordion. Connecting residents to the natural world is another trend. Some communities incorporate greenhouses or rooftop gardens into building design. Others, like Brandywine Living at Mahwah in Bergen County, NJ, grow herbs like rosemary and thyme in a green wall designed for them by Meyer. Of course, nothing beats the health benefits of being outside in nature. “There [are] a significant number of research studies that really talk about nature's ability to impact not only mood but actual physical health,” says Metricarti. This being the case, access to nature is high on Living Branches’ priority list. For instance, a planned cottage development at Souderton Mennonite Homes will be attached to community green space and a network of walking trails that connect to the town of Souderton. 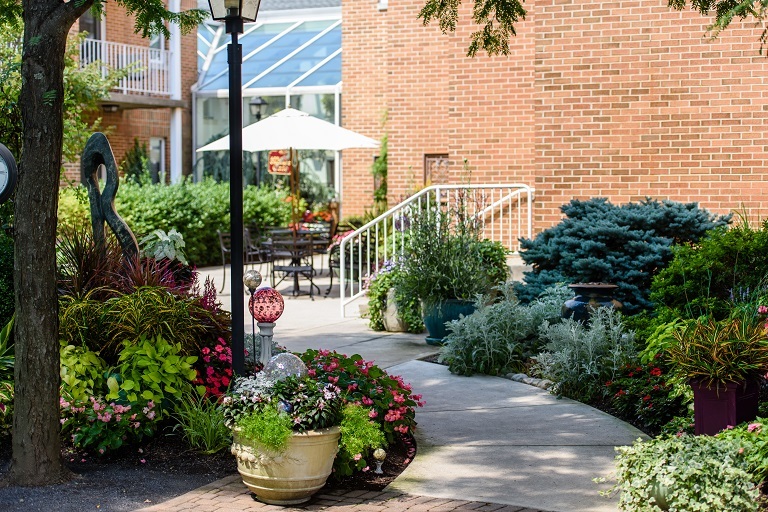 Living Branches encourages residents to be outdoors, so landscaped courtyards are a must. Meadowood has also invested in designing spaces to encourage residents to be active in the outdoors. This community is located on 131 acres and includes over a mile of wooded trails. (Residents built bridges over some of the streams.) Plans include a walking trail around the community’s perimeter road as well as an accessible trail to a tree house to be built about 15 feet off the ground, overlooking the Meadowood Nature Preserve. This community has also built an outdoor recreation patio, which can be used for exercise classes as well as physical and occupational therapy. Loneliness can have a profound effect on an older adult’s health—in fact, it’s linked to decreased resistance to infection, dementia, and increased emergency admissions to hospitals. One way to combat isolation is through design, for example, creating a pocket neighborhood, a small self-contained neighborhood within a larger community. Some retirement communities are so big it “feels like a small city, and that's not something that's necessarily friendly for somebody who's 80 years old and moving in,” points out Metricarti. At senior living communities one of the most social spaces is the dining area. Still, many communities have cavernous dining rooms that don’t feel warm and welcoming, points out Metricarti. She asks: “How do you keep the usefulness of … [a large dining room] while still making it feel more user-friendly and more intimate, more encouraging of conversation and relationships between the people who are in there, not just this giant hall [where] you're going to walk in, grab a meal, and leave?” At its Dock Woods campus, Living Branches installed movable booths that could carve up space in the dining room, making for more intimacy, yet can be moved out of the way to accommodate special events. One LeadingAge member is making the most of a rare opportunity to create an entirely new campus focused on wellness-based living for those 62 and older. It’s only fitting that the site it has chosen has its own long history as a center for wellness. Phoebe Ministries, a full-continuum provider based in Allentown, PA, recently purchased the 38-acre campus of Rodale, Inc., in nearby Emmaus, PA. Rodale Press, the company’s publishing arm, was famous for its successful health-related magazines, including Prevention, Men’s Health, Runner’s World, and other wellness-oriented periodicals and books. After the company was sold to Hearst Communications in 2017, the family sought a buyer for the vacated campus and Phoebe stepped into the breach. Chestnut Ridge at Rodale campus. The Borough of Emmaus and the Rodale family were instrumental and enthusiastic in making the transfer of the property work. 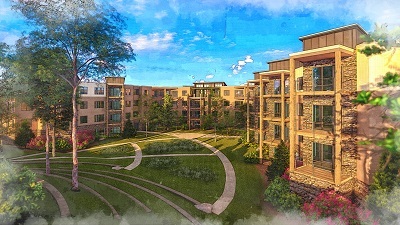 Chestnut Ridge at Rodale is Phoebe’s vision for its new campus, an independent-living community that will accommodate 240-plus residents in years to come. Early plans are to adapt and repurpose an existing 3-story Rodale office building into an apartment building with a center courtyard. A 1-story office building on the property will be replaced by a 4-story horseshoe-shaped apartment building with views of South Mountain. The 2 buildings should have 122 units combined. Rodale’s wellness focus was reflected by the many walking and biking trails, plus ample green space, that it created on the campus for its employees, and Phoebe will maintain them for its new residents. “We’re keeping the trails, and there will be a pool, a fitness center, and we’re looking at how to use local food sources and more,” says Donna Schudel, Phoebe’s community relations & grants specialist. The campus will include amenities to include a pub, outdoor dining, wellness and fitness studios, personal gardening areas, and more. There is still much planning to be done, says Schudel, and Phoebe is now in the pre-sale and land development phase. She estimates a timeline of 11-18 months for the pre-sales, with groundbreaking in 2020. “Residents will be connected with all our Phoebe resources,” says Schudel, “with access to rehab, long-term and memory care services.” She adds that is will be a fee-for-service contract model, with a deposit and monthly fees. Meadowood’s canopy-covered outdoor recreation patio, which comes complete with a kitchen, is also used for concerts and other special events. “We have a really neat shading system that can either be completely drawn closed to provide shade, or can be completely open,” says Grieb. Although shading may seem like a small detail, a good system can make a big difference to older adults. “The thing about natural light though, is you have to design spaces, especially outside, where [older adults] can have shade and … dappled light and not necessarily full sunlight [as they can have] problems adjusting their eyes,” points out George Wilson of Meyer Architects. Providers shouldn’t stop at this--they should also promote interactions between residents and local citizens. Communities need the public to see them “as a place to gather, a place that doesn’t just belong to the residents,” says Metricarti, who adds that the gift shop and café at the Souderton campus are open to the public. “Executives from the local bank, for example, will come in and have lunch meeting at Souderton Mennonite Homes—they’re not visiting anybody—they just came in to eat in the café,” she notes. Pittsburgh’s Morningside Crossing, a project of the aforementioned NK Architects, provides affordable housing plus a community center that opens itself up to neighborhood seniors. It’s a good mix of something that both supports the residents and the greater community, says Nicholson. For its part, Meadowood plans to work with local schools and scout groups to deliver intergenerational educational programs in a planned outdoor amphitheater. Connecting with others in the community, especially kids, has a positive impact on residents’ health, says Grieb. Katherine O’Brien is a writer who lives in Toronto, ON, Canada.